Okay, not quite dinner, I know (although I could eat these stuffed artichokes until I’m downright stuffed myself). I found this lovely little recipe and video how-to on Daily Candy about a year ago and have been making it for quiet nights in and dinner parties to rave reviews every time. 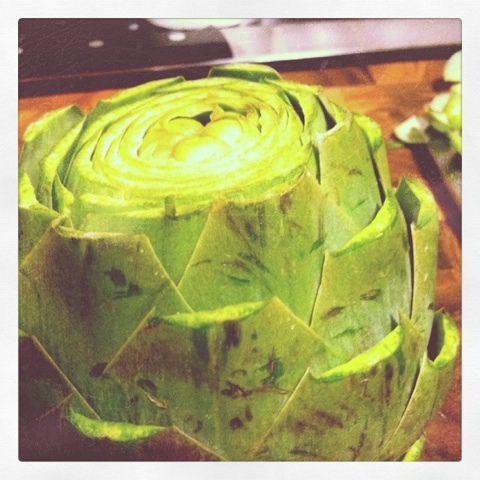 The recipe instructs that you cut off the top of the artichoke and the stem so that it can sit flat. I use kitchen scissors to snip off all the pointy leaf tips then open up the artichoke so it looks like a pretty ranunculus flower. Then, create a simple little mixture of Parmesan, oregano, bread crumbs (I usually just crumble up crackers or wheat thins – whatever I have on hand), and garlic salt to taste. Spoon the dry mixture into each little leaf so that later there’s a tasty nugget on each of the leaves when you pull it off. Add some garlic to the center and then place the artichokes in a pot or deep pan with a half inch of water in the bottom. Drizzle a little olive oil over the artichokes, turn the stove to medium heat and steam them for about 40 minutes. When they are done the leaves will be easy to pull off and it’ll smell crazy delicious. Be careful, though, because it stays hot and steamy for a while. 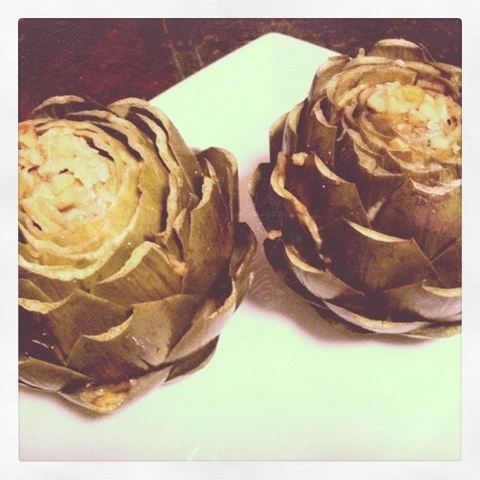 Never eaten an artichoke like this? Pull an individual leaf and hold it with your fingers by the tip. Put the bottom in your mouth and slide it through your teeth to get the meat of the artichoke and cheesy goodness. If you’re entertaining, don’t forget to leave out a plate or bowl for guests to discard their scraped-off leaves (kinda like the already-sucked-out-shells of edamame). On the other hand, if you’re at home in front of the couch, just chuck ’em back onto the plate when you go back for the next one!